Come by for a complete Lloydminster eye exam with our eye doctor! Regular Eye Exams & Why They Are So Important! Our focus is on your quality eye health and vision! Routine eye exams inspect the health of your visual system, in the same way, that a physical exam checks your overall body condition. Even if your vision is crystal clear and your eyes feel fine, you still need regular examinations – at every age and stage of life. Contact us to schedule an appointment with one of our eye doctors. I had a vision test recently. Do I still need a comprehensive eye exam? Yes. Basic vision screening often provided at your local pharmacy or in school, does not replace detailed eye exams performed by your trusted eyecare professionals at Prairie Vision. Vision screening involves having you read an eye chart to determine your need for eyeglasses or contact lenses. However, it does not evaluate eye health or all the parts of functional vision. Our optometrist will use the latest refractive technology and precise optometric equipment to assess your entire visual system, looking out for signs of disease or abnormalities. Can I have an eye disease, even if I have no symptoms? Yes. In general, common eye diseases, such as glaucoma, diabetic retinopathy, macular degeneration, and cataracts, do not present symptoms at the beginning. Once you notice a problem with your vision, the disease has typically progressed to a later stage – when effective treatment is more challenging. The earlier we diagnose your eye disease, the better we can prevent vision loss! The only dependable way to diagnose eye disease when it starts is through a comprehensive eye exam by an eye doctor. In addition, a thorough eye exam can detect signs of a dangerous health condition, such as hypertension, diabetes and high cholesterol. These diseases often show up in the eyes way before you know you have them. What will happen during my eye exam? Preliminary assessment of your vision and ocular health. Our optometrist will use a slit lamp to light and view your cornea, lens and inner eye tissues. 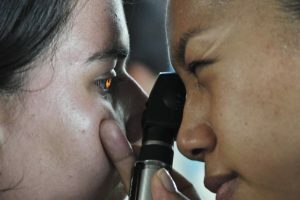 Dilated exam to check your eye health closely. Dilating eye drops will first be inserted, and then we’ll inspect your retina, optic nerve, and vitreous fluid, with the aid of high-powered magnification. What Happens After My Eye Exam? Once our eye doctor completes all the necessary tests and procedures, we’ll share the results with you. We believe that our patients should be well-informed about their eye health, and we encourage you to ask questions! Our friendly team will address your concerns with clear explanations and patience. If vision correction or treatment is needed, we’ll discuss the best course of action for your visual requirements and lifestyle considerations. Contact us today to schedule your annual eye exam. We look forward to serving patients in Wainwright and surrounding areas.